Sterling Silver Birthstone Bracelet with Heart Charm for Women or Girls. Angel Bracelet with Any Name. personalised Bracelet, "Made for an Angel" Charm. Name Bracelet with Ballet Slippers Charm, Personalised Girls Jewellery. Wholesale Jewellery Making Supplies. 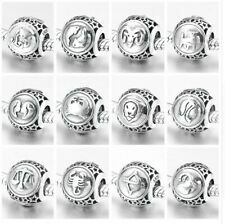 Silver tone clip on charms. Quantity: 10 Size: 23 x 9mm including clasp. Non threaded, 5 mm hole. Solid silver with cubic zirconia. Two-sided, with twelve (12) clear cubic zirconia stone. 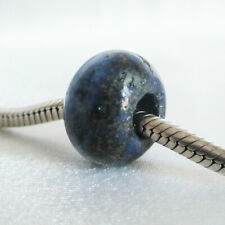 SEE OUR SILVER JEWELLERY TO GO WITH THIS BEAD! Alien face charm with lobster clasp. Suitable bracelets, necklaces, phones, bags etc. Lead and nickel free. This listing for 1 x 9mm Italian Charm with an ANGEL on a SHINY finish base. Our 9mm charms are compatible with ALL brands of standard size / "classic" Italian Charms. ***please read the full description BEFORE buying*** Remember to click ADD TO BASKET to ensure you always qualify for our promotions and SPECIAL OFFERS! Don't just click Buy It Now!. Silver tone Angel wing floating locket charm. The charm is approx 11mm high and approx 4mm wide. The charm is small and is only suitable for floating lockets. They are not suitable for Pandora or charm braceletsas there is no hole for threading or hanging. They fit any size wrist as you can choose the number of charms in the bracelet, plus you can add or take out links whenever you like. This listing for 1 x 9mm Italian Charm with a YIN YANG on a SHINY finish base ***please read the full description BEFORE buying*** Remember to click ADD TO BASKET to ensure you always qualify for our promotions and SPECIAL OFFERS! Don't just click Buy It Now!. 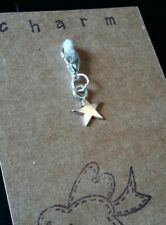 Silver tone star floating locket charm. The charm is approx 6mm high. The charm is small and is only suitable for floating lockets. They are not suitable for Pandora or charm braceletsas there is no hole for threading or hanging. This listing for 1 x 9mm Italian Charm with DREAM & RAINBOW on a SHINY finish base ***please read the full description BEFORE buying*** Remember to click ADD TO BASKET to ensure you always qualify for our promotions and SPECIAL OFFERS! Don't just click Buy It Now!. This listing for 1 x 9mm Italian Charm with a BLACK STAR on a SHINY finish base ***please read the full description BEFORE buying*** Remember to click ADD TO BASKET to ensure you always qualify for our promotions and SPECIAL OFFERS! Don't just click Buy It Now!. All our Italian Charms are stainless steel. This listing for 1 x 9mm Italian Charm with a GOLD STAR on a SHINY finish base ***please read the full description BEFORE buying*** Remember to click ADD TO BASKET to ensure you always qualify for our promotions and SPECIAL OFFERS! Don't just click Buy It Now!. Floating locket charm - heart with crystal. The charm is approx 8mm x 7mm. The charm is small and is only suitable for floating lockets. 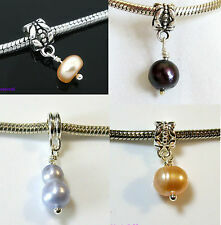 They are not suitable for Pandora or charm braceletsas there is no hole for threading or hanging. A Classic Size multi gem heart Italian charm By Daisy Charm® This Daisy charm is 9mm in size, has a shiny finish. The charm has the brand name Daisy Charm stamped on the back and comes in Daisy charm packaging. The picture show is not the exact item size and colours may vary slightly with stock. If you need more information about Italian charms and how they work please see our "About Italian Charms" page in our eBay shop. Silver tone floating locket charm - guardian Angel with a tiny crystal at the top. The charm is approx 9mm high and approx 7mm wide. The charm is small and is only suitable for floating lockets. They are not suitable for Pandora or charm braceletsas there is no hole for threading or hanging. The charm is small and is only suitable for floating lockets. They are not suitable for Pandora or charm braceletsas there is no hole for threading or hanging. The charm is approx 9mm high. One locket with endless possibilities. SIZE : Height: 7mm. Across: 6mm. COLOUR : Silver. and direct bank deposits. THIS IS A LOVELY LARGE SILVER ANGEL WINGS HEART WITH RHINESTONES PENDANT AND SILVER SNAKE CHAIN. IT IS MADE FROM SILVER PLATE AND CLEAR RHINESTONES. IT HAS A LOBSTER CLIP TO CLIP THE PENDANT ONTO THE CHAIN. 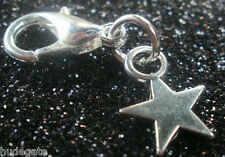 This listing for 1 x 9mm Italian Charm with a STAR on a SHINY finish base. Our 9mm charms are compatible with ALL brands of standard size / "classic" Italian Charms. ***please read the full description BEFORE buying*** Remember to click ADD TO BASKET to ensure you always qualify for our promotions and SPECIAL OFFERS! Don't just click Buy It Now!. A Classic Size Gem Star Italian charm By Daisy Charm® This Daisy charm is 9mm in size, has a shiny finish. The charm has the brand name Daisy Charm stamped on the back and comes in Daisy charm packaging. The picture show is not the exact item size and colours may vary slightly with stock. If you need more information about Italian charms and how they work please see our "About Italian Charms" page in our eBay shop. 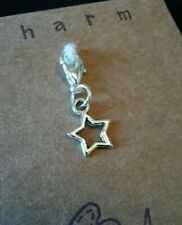 LARGE SILVER PLATED SUN DANGLE CHARM. DANGLE CHARM. AN ATTRACTIVE DANGLE CHARM. "SILVER SUN ". SILVER PLATE.